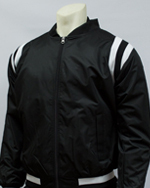 Black Jacket with Lightweight Polyester Shell. Black & White Stripe shoulders and wrists. Fully Lined. Front Full Zipper. Side Front Pockets. Weather Resistant Coated Poly Shell and Nylon Lining.